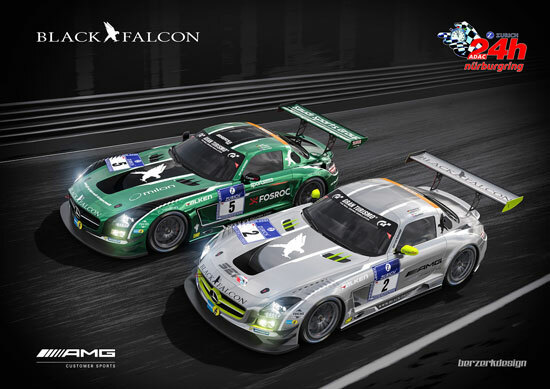 Team Black Falcon’s title-defending #1 Mercedes successfully crossed the finish line in second place overall during the 42nd edition of the prestigious ADAC Zurich 24-Hour race, despite all obstacles faced at the arduous event. The weekend got off to a promising start, with the #14 Black Falcon-entered Mercedes SLS AMG GT3 clocking the fourth fastest lap – 8 minutes 14.290 seconds – in Friday evening’s Top 30 Qualifying shootout, while its sister #1 car managed seventh place on the starting grid after lapping the Nordschleife in 8 minutes 15.098 seconds. However, with qualifying times in endurance racing meaning very little, the two cars were still eyeing a second successive victory at the legendary racetrack. Saturday’s race start saw the #14 Mercedes, shared between Yelmer Buurman, Abdulaziz Turki AlFaisal, Hubert Haupt and Adam Christodoulou, jump from fourth to third place overall, which later became first place overall just one hour into the race, while the #1 car played it safe and maintained its position. Both cars remained in contention for victory, lingering in the top 5 for the majority of the first half of the race. However, disaster struck on the eleventh hour when the rear suspension on the #14 Mercedes failed after an Aston Martin hit it from the back. 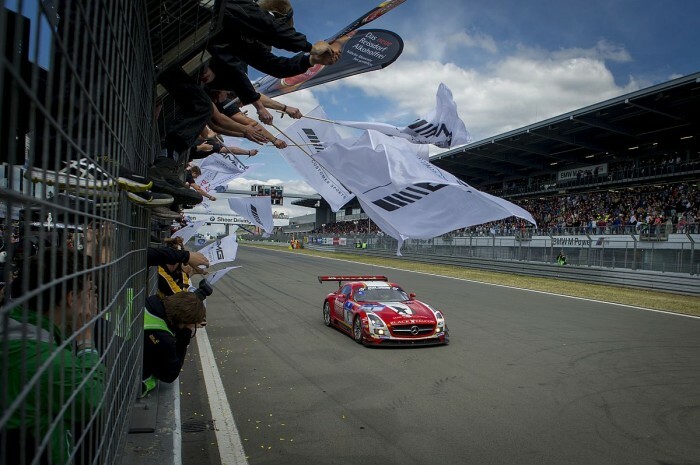 Despite repair attempts, the #14 Black Falcon SLS AMG GT3 was forced into retirement with 9 hours to go, leaving only the #1 Mercedes to defend the team’s colors. As the #14 green and black Mercedes officially retired, the #1 red car took the race lead and rekindled the team’s hopes of winning the 24-hour race for a second year in a row. Team Black Falcon’s troubles were far from over, though, as chances of a victory took another hit when the leading #1 car was given a penalty after failing to abide by the minimum pit stop time rule. Drivers Lance David Arnold, Jeroen Bleekemolen, Andreas Simonsen and Christian Menzel refused to give up, and kept the #1 car in the top 3 during the closing stages of the race. With 4 hours to go, the team moved to second place overall, but was never able to mount a challenge against the leading factory-backed Phoenix Racing Audi that was too far ahead, and eventually settled for the runner-up spot, just 3 minutes off the top spot, which on a tremendous track like the Nürburgring Nordschleife, is considered a minimal gap. 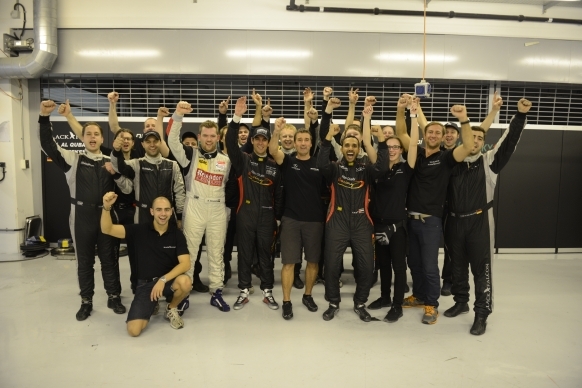 Team Black Falcon overcame an incident-filled race that was contested by more than 150 cars, on arguably the most dangerous track in the world, to finish on the podium; the best result the team could have hoped for given all the unexpected drama. 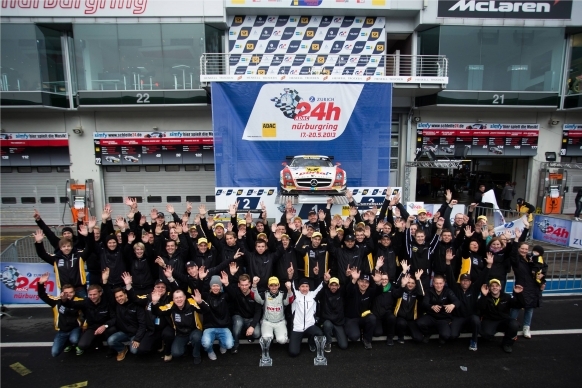 We would like to dedicate this grand achievement, stepping up on the 24 Hours of Nürburgirng podium for two years in a row, to the late Sean Edwards who drove our car to victory in the 2013 edition of the race.